2015 ended with three very successful concerts. The November concert at St. John’s Church, Carrington celebrated the International Year of Light. The church was beautifully candlelit and the music covered a wide spectrum of styles all pertaining to the theme of light. The second half of the concert was a performance of Fauré's Requiem. The terrible terrorist attacks in Paris had occurred the previous night and so it was fitting that before we sang the Requiem, Richard asked the audience to join the choir in a few moments of silence as a mark of respect to those who had died. Our annual Christmas concert at Patchings was, as usual, very well supported and we repeated the programme at Beeston Parish Church a few days later. Our first concert of 2016 will be held on March 5th, again at St. John’s Church, Carrington (NG5 2DL) at 7.30 pm, and promises to be an exciting musical experience. The programme features pieces by two very diverse German Composers – Heinrich Schütz and Hugo Distler. 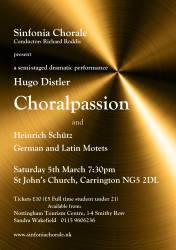 The programme includes German and Latin Motets by Schütz and the Choralpassion by Distler. Heinrich Schütz (1585 -1672) is generally regarded as the most important German composer before J.S. Bach and is often considered to be one of the most influential musicians of the Seventeenth Century along with Claudio Monteverdi. He composed large amounts of both sacred and secular works but his best known compositions are in the field of his sacred music of which these Passion Motets are a fine example. Hugo Distler (1908- 1942) is now recognised as one of the most significant German composers of his generation. He was a composer, conductor, organist and teacher. His works show the influence of old forms and styles, particularly the music of Heinrich Schütz. However, his innovative harmonic style caused him to come into conflict with the Nazi authorities, who considered his compositions to be “degenerate art”. The Choralpassion will be a semi-staged dramatic performance with lighting. Highlights of the concert are being repeated at Southwell Minster on Monday 21st March at 7.30 pm as part of Holy Week. Best wishes - we hope very much to see you at our concerts.